Talk by Jean Eddy Saint Paul, professor of sociology, founding director, CUNY-wide Haitian Studies Institute, housed at Brooklyn College.Carnival and Political Consciousness in Haiti: From Boukman Eksperayns to Brothers Posse - Lecture by Jean Eddy Saint Paul, Founding Director, CUNY Haitian Studies Institute, Brooklyn College. The event is a part of the "Carnival Week 2019. Routes to Roots". Introductory talk by Jean Eddy Saint Paul, professor of sociology, founding director, CUNY-wide Haitian Studies Institute, housed at Brooklyn College. 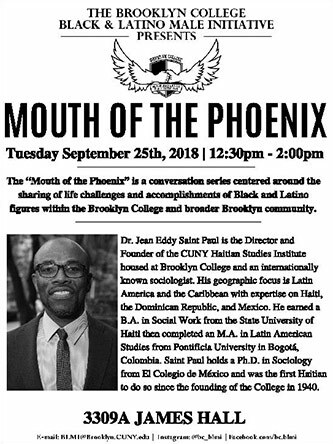 "Mouth of the Phoenix" is a conversation centered around the sharing of life challenges and accomplishments of black and Latino figures within the Brooklyn College and the broader Brooklyn community. 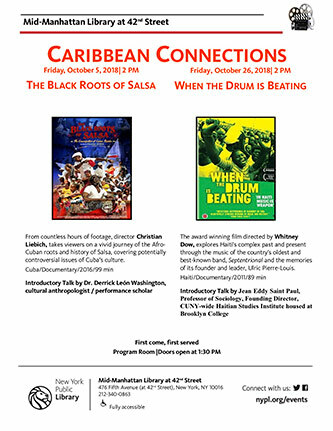 Jean Eddy Saint Paul is the director and founder of the CUNY Haitian Studies Institute, housed at Brooklyn College, and an internationally known sociologist. His geographic focus is Latin American and the Caribbean, with expertise on Haiti, the Dominican Republic, and Mexico. He earned a B.A. in social work from the State University of Haiti, then completed an M.A. in Latin American studies from Pontificia University in Bogotá. Saint Paul holds a Ph.D. in sociology from El Colegio de México and was the first Haitian to do so since the founding of the college in 1940.